The city of Vrútky lies at the confluence of Váh and Turiec rivers in the northern part of the Turiec basin in the centre of Žilinský región. The E 50 road connection and a railway junction of international significance assure an easy approach to Vrútky from all directions. Local bus service connects Vrútky with the city of Martin and neighboring villages. Vrútky is an entrance gateway to the región of Turiec with all of its cultural and natural attractions. One of the most popular marked paths is the path to the Chalet at Kľačianska Magura (1120 m), from which the path can lead you to the hills of the Malá Fatra National Park, ; including Veľký Fatranský Kriváň hill (1709 m), the highest peak of this range. A hike on a marked tourist route to ; Minčol hill (1364 m), one of the most beautiful hills of the Lúčanská Malá Fatra range, can be prolonged to the Chalet at Martinské hole or to Strečno. The summer recreation facilities in Vrútky also include the summer swimming pool with heated and cleaned water and cycloroutes Turčiansko-Vážsko-Fatranská cesta and Turčianska cyklomagistrála, which connect Vrútky with other villages of Turiec región. The skiing resort Piatrová and the nearby skiing resorts at Martinské hole hills, Jasenská dolina valley, and Valčianska dolina valley, offering a complete range of skiing services, make Vrútky an ideal centre of winter recreation. Good accommodation facilities (Julianin dvor, chata Piatrová...) as well as restaurants and pubs (Alžbetin dvor, Chopper dub, Marco Polo, Pod sukňou, Linda...) provide services necessary for the development of tourism in the town and its surroundings. The oldest written record of Vrútky dates back to 1255. The name of the town probably comes from an old Slavonic term for a spring. Vrútky, originally devided into Upper and Lower Vrútky, experienced a remarkable growth after the construction of Košice - Bohumín railway and the state railway MÁV, as well as after the construction of the railway engineehng and mending company in the 1870's. The number of inhabitants doubled in this decade and its growth continued on. 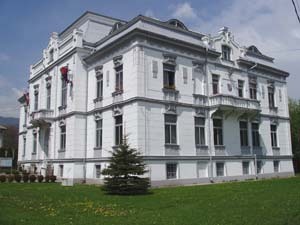 Vrútky obtained a city štatúte in 1960 and and then again in 1990 after having been a part of the city of Martin for almost two decades. The history of this town is reflected in its buildings. Stanislav Zachar, a builder from Vrútky, cooperated on the construction of many of them, either as a builder or a designer. The building of Neo-Gothic Roman CatholicChurchof St. John the Baptist (1905) built on the site of an Early Gothic church from the 13th century, the building of the Municipal house (1926), the location of the present City halí, or the building of the J e w i s h synagogue (1910), the present cultural object Kriváň, belong to them. The Neo-Gothic Evangelical Church A.C. of Dr. Martin Luther (1903), or the Workers' house, contemporary Kino 1. máj cinema, prove the spreadof Vrútky in the first decades of the twentieth century. As to the local museums, it is necessary to mention the newly opened Room of Hana Zelinová, an important Slovák writer and a native of Vrútky. Among regular cultural-social events in Vrútky belongs the Vrútky Music Spring, as well as the Vrútky market and the City days, organized annually in September. Education in Vrútky is represented by two elementary schools, one art school and a grammar school. The Domino free time center plays a significant part in the field of leisure activities of local youth.